Note that a common problem is Riva 128 cards are not set up right (still). Go HERE if you think your card may not be. Install the 2.77 drivers and the latest version of Direct X. Using DirectControl right click the icon it creates in your system tray. Now, go up to Direct Draw. Choose DISABLE. The most common slowdown in a Direct 3D game is caused by mipmaps. Disabling them is very simple. See this picture (the Carmageddon 2 picture) to possibly help you tweak Nv3tweak for a game yourself. If this DOES speed things up a lot, let me know the game name and any other values you may have changed. This game runs slow on almost every system. DO NOT use -highres, it will run very bad. To correct the slow speeds make sure your card is set up according to my Riva Tweak Guide. Then go to your display properties (right click desktop, go to properties) and choose the Riva 128 tab. Make your settings look like this picture. To correct the 'disco lighting' install the 2.77 drivers, available in the Riva Tweak Guide. You should set up your card's Riva 128 tab (see above) to the same picture. From the game's directory, run Ddconfig.exe and choose Advanced Properties. Make sure it is set to use your Riva 128 (primary display) and check the Disable Mipmapping box. From the game, click the Graphics settings (the eyeballs) from options. Play with the gamma untill it is an acceptable level. Final Fantasy VII Direct 3D Upside-down movies, Odd graphics errors, or game crashes. To fix the movie problem uninstall all CODECs you have. This will most likely fix it. To uninstall CODECs, enter Control Panel (Start Menu/settings/Control Panel) and choose Multimedia. Choose the Advanced Tab. Now, click on Video Compression Codecs. You can now click on them individually and choose Properties, followed by Remove. If you haven't done it yet, you must install the Riva patch for it to work correctly. If you have weird backgrounds, go to your Riva 128 Tab in display properties (Nv3Tweak), Change USE SQUARE TEXTURES ONLY. For the game crashing, try FIRST setting up your swap file as normal (as compared to fixed size). If you're using the Yamaha MIDI try setting your sound card to NOT USE FULL DUPLEX and this may fix it. Also make SURE you're using the nVidia 2.0 reference drivers. You can get them from my Riva Tweak section. Forsaken Direct 3D ugly Make sure the resolution is either set to 640 x 480 or 800 x 600. Enable all graphic details. This game runs fast. G-Police Direct 3D White blocks or runs REALLY slow If you have an AGP card, make sure it is set up right HERE. If you have a PCI card change ANIMATED TEXTURES to LOW or MEDIUM. Disable ANTI ALIASING. Also disabling CD AUDIO seems to help a lot. Grand Theft Auto software Too Slow This game is not accelerated, but can be sped up if you run the Windows version in 512 x 384 or 640 x 480. Go HERE for my Riva setup/tweak guide. Make sure you're using low quality sounds to avoid hard drive thrashing. To bring up the brightness go to the IdGamma homepage and download the newest version. It works great with this game. Interstate '76 Direct 3D or software Slow gameplay or ugly Download the Direct 3D patch from Activision. Disable Shadows. Also try unchecking the USE SQUARE TEXTURES ONLY box. Jedi Knight Direct 3D Unsupported video modes or poor performance. 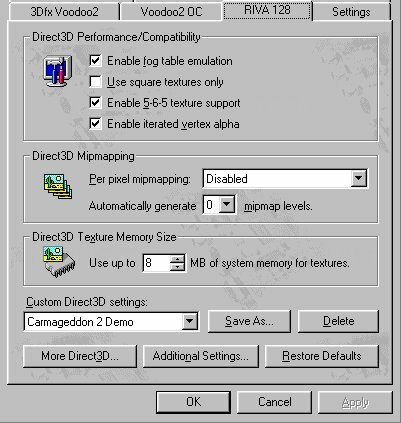 In the Riva 128 tab set at least 8 MB of Direct 3D texture memory. The highest resolution with Riva 128 you can use is 960x720. The highest resolution with Riva ZX (8 MB) you can use is 1024x768. Make sure you have the 2.0 drivers or newer. This is pretty much a must. You should set visual quality all the way up and resolution to 640x480 or 800x600. This game really runs good on Riva 128 too. If performance is low, try disabling Mipmaps in Nv3tweak. Finally a FINAL patch game out. MDK Direct 3D Slow gameplay Make sure you have the Direct 3D patch. Go to Shiny's home page..
Monster Truck Madness 2 Direct 3D Slow gameplay Turn sound quality down and/or music off (it's bad music anyway). Set visibility down to 60% or so. Go to the Nv3tweak control panel applet. (Go to Control Panel, then Nv3tweak). If you don't have it, you can grab it over at the files section. Enable everything. See this picture if you don't understand. Start MotoRacer 2 in nVidia (Direct 3D) mode. If it goes too slow, exit the game, switch your desktop to 640x480. Restart the game. If it still runs too slow hit ALT-ENTER to switch to an almost-full-screen window. Now it should be fast! If you bought this game you were probably stunned to find out it had no support for Direct 3D (I know I was!). You can't tweak it too much, but here's a couple ways that help a little bit. First of all, to make sure you're not having too much hard drive access read my hard drive tweak guide. Set your display colors to 16 Bit (I noticed a slight performance increase). Unload all other programs (I highly recommend this for all games). Go HERE for my Riva setup/tweak guide. This will help you get the colors right. For more tweaking head over to 3 Finger's site. Quake2 OpenGL MANY Go HERE for my Riva setup/tweak guide. To fight excess HARD DISK reading try my HARD DRIVE TWEAK GUIDE. You can also make your own autoexec to completely optimize the game HERE. Redline Racer Direct 3D slow You should set up your card's Riva 128 tab (see above) to the same picture. SiN OpenGL MANY Go HERE for my Riva setup/tweak guide. To fight excess HARD DISK reading try my HARD DRIVE TWEAK GUIDE. You can also make your own autoexec to completely optimize the game HERE. The most common problem people had with OpenGL with SiN that emailed me was they were not in 16 Bit color depth. Make certain that you are in 16 Bit color mode when running OpenGL with Riva 128 cards. This game only supports Glide, which even on my Voodoo2 runs bad. This game is beyond tweaking. In fact, it's a crappy game anyway. Install the 2.77 drivers and the latest version of Direct X. Using DirectControl right click the icon it creates in your system tray. Now, go up to Direct Draw. Choose DISABLE. Start the game and it should be much better. To see framerates, hit ESC then F.
Mine jumped from a jerky 15 fps WAY up to 95 fps. Tomb Raider 2 Direct 3D VERY slow gameplay, runs choppy, severe cracking Try setting MIP-MAPPING levels to 0 in Nv3Tweak. Make sure the CD is in the drive. From the Tomb2 directory at the command prompt type "TOMB2.EXE -SETUP" (no quotes) to setup. Turok Direct 3D Will not run, or is ugly Disable USE SQUARE TEXTURES ONLY. Make sure you have Direct X 5 or higher installed. Set up the graphic options in the menu of the game, enable everything. Resolution at 640 x 480 or 800 x 600. Tweak your computer out like hell! Disable any extra features in the game you need to in order to increase framerates. Virtua Cop 2 Direct 3D Slow or Choppy Check to see if you're in Direct 3D mode. Hit ALT, then goto DEVICES, then you should see Direct 3D (Primary Display) or something similar. This game tweaks the same as Subspace. Install the 2.77 drivers and the latest version of Direct X. Using DirectControl right click the icon it creates in your system tray. Now, go up to Direct Draw. Choose DISABLE. Start the game and it should be run normal.